Harbour Cruises – The Great KiwiCombo Pass. See New Zealand your way! The stunningly beautiful environment of Akaroa Harbour is renowned as being home to the rare hectors dolphins, but there is much more. 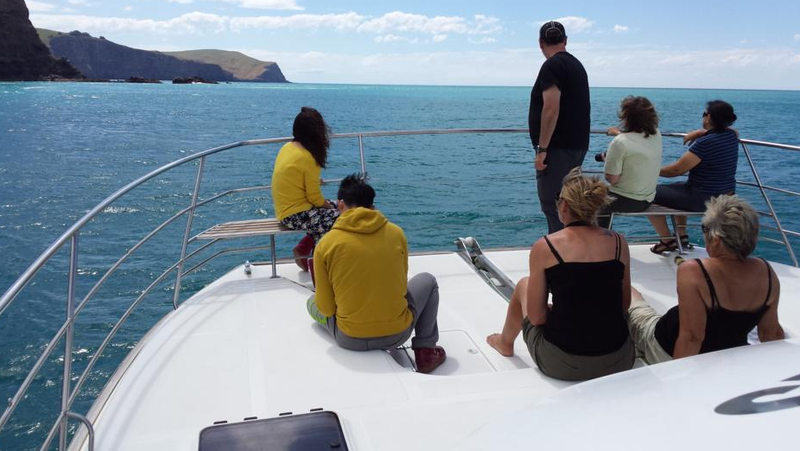 Something special happens every day at Akaroa when “Into the Blue” gently eases away from the jetty for its very intimate cruise of Akaroa Harbour. This modern, well-appointed vessel is the perfect size to maximise the nature cruise experience, being relatively small, but fast and stable for easy cruising. From the first step on board the warm hospitality of the crew is very apparent with friendly smiles, a complimentary drink (juice, water or wine!) and efficient safety briefing. Forget your sunblock? No worries, there is some on board! In some ways Akaroa Harbour is an understatement. The setting is truly spectacular, the colours vivid, but once the skipper begins his comprehensive commentary, the detail of the Maori and European history, volcanic geology and rare wildlife really comes alive. The rare hectors dolphins are the star performers of the trip. These are the smallest and rarest dolphin in the world and they are now totally protected in the marine reserve in and around the harbour. Some 1100 reside here so spotting them is quite a common occurance – although of course never guaranteed. Such are the whims of the wild! November to February/March is the best time to view the mothers and calves as they cavort around the bow waves. But this nature cruise offers so much more. We also saw the very cute blue penguins, flipping around fishing for their lunch. Fur seals lazing on the warm rocks in the sun are a bit harder to spot, but once you see one, you’ll see lots as your eyes adjust to distinguish between a rock and a seal. The birdlife is amazing, particularly seeing the nesting sites high up on the cliffs. And their fishing prowess is very enviable! There is ample comfortable seating on board, either on the lower or upper deck, plus inside the weather-proof saloon area. Tea/coffee is available and on the return trip back to the jetty fresh-baked cookies are served! A delicious touch! Akaroa can easily be visited from Christchurch, being just a 1 hour, 15 mins drive away, or you can overnight in the village and enjoy the seaside atmosphere. The dolphin cruise departs daily (several times daily in the summer), duration approx 2.5 hours. A wonderful, relaxing trip that comfortably combines spectacular scenery, wildlife and fresh ocean air. The “Into the Blue” is perfect for small-group cruising so reservationsare highly recommended.